Currently, there is no legal requirement for places of education to have access to a defibrillator. However, campaigners are pushing for new laws to bring about the introduction of defibrillators in all public places, including schools – and some schools have already decided to install these devices. The issue has been making headlines due to young people dying from Sudden Cardiac Arrest (SCA) while in school. Every year, more than 600 young people in the UK die from SCA – with almost half of these deaths taking place in schools. The coverage is backed by organisations such as the Oliver King Foundation, which campaigns to raise awareness of the condition and for measures to be put in place to prevent SCA-related deaths. AED’s in Schools – The Foundation’s recent e-petition called for the government to “introduce defibrillators to all public buildings by 2017” and it garnered more than 110,000 signatures, sparking a debate in Parliament. And while ministers have said they are not minded to introduce legislation, similar campaigns in the US have resulted in the passing of laws enforcing the implementation of on-site defibrillators, and the campaign in the UK is continuing to gain support. In some countries, and in most states in the USA, ‘Good Samaritan’ legislation protects those who go to the help of others. No such legislation exists in the UK; so many people’s first major concern is the legal situation of those who attempt to resuscitate someone. Might a potential rescuer be sued after trying to resuscitate someone who has collapsed? The short answer is that it is very unlikely that a potential rescuer could be sued. 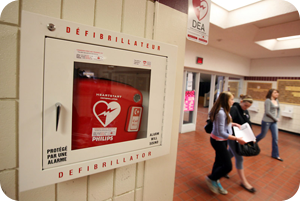 Due to the time-critical nature of administering treatment using a defibrillator, the responsibility for its use falls upon those closest to the incident – in this case, the school’s staff. Inevitably, this is a cause for concern for head teachers – can the school be subjected to a negligence claim if the equipment isn’t used, or if it is not used properly? Recently, plans were approved by Liverpool City Council to install a defibrillator in every primary school in the city. An automated external defibrillator (AED) is a portable device that analyses the heart’s activity and, in the event of cardiac arrest, administers an electrical shock through electrodes placed on the chest. This shock can restart the heart, potentially saving a life, provided that it is used in a timely fashion. If defibrillation is administered correctly the survival rate of cardiac arrest is approximately 75 per cent, although this falls by around 10 per cent for every minute of delay. The installation of a defibrillator requires teachers and staff working in education institutions to be trained in its use. Training staff on the use of the device plays a key part in ensuring that it is correctly employed, and those with this knowledge will have to be on-hand in the event of a cardiac arrest situation. Fortunately, due to their relatively straight-forward operation, defibrillators require little training. Defibrillators provide voice prompts to the operator, instructing them on what action to take to resuscitate a person who has suffered from a cardiac arrest. 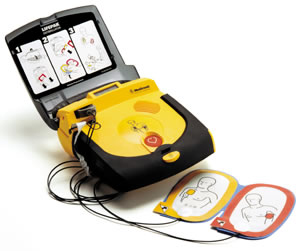 For AEDs, it is this automation that ensures that their use is both simple and safe. After the user adheres two sticky pads to the patient’s chest, the machine will then automatically assess whether or not to administer a shock. Due to this ease of operation, it is unlikely that a claim would stem simply from the use of a defibrillator, as a claimant would have to prove that a casualty’s condition was made worse through its application, compared to if it had not been used at all. There is a potential for claims to arise if the equipment is not properly maintained, and responsibility for this lies with the school. Although the device’s electrodes only have to be replaced once every two years, and the defibrillator automatically performs tests every day, a staff member should still be made responsible for carrying out checks. Importantly, if schools became legally obliged to possess a defibrillator, a plan would need to be put in place to ensure all staff members are aware of its location, and know who is responsible for its use – this should also be backed-up by relevant documentation. Sixty-five MPs have now backed the Oliver King Foundation’s appeal for defibrillators in schools and although it was stated by the health minister that no legislation would be introduced as a result of the e-petition earlier this year, the campaign continues.